La Petite Grange, a Charming Farmhouse In the Charente. This enchanting farmhouse is waiting for you to fall in love [everyone does], La Petite Grange offers total privacy with its fully enclosed sunny courtyard, it is so pretty and full of character. The Charente and its gentle climate are well known and so La petite grange offers the perfect location for a truly relaxing holiday. The property is perfect for a group of family or friends travelling together, the twin studio which is reached either across a first floor balcony or an outside stone staircase from the courtyard, offers the occupants privacy from the rest of the household, also as well as the downstairs sitting room we have a first floor TV lounge. Set amongst rolling hills and wooded farmland the property has been comfortably furnished and offers a relaxed retreat in the heart of this beautiful region. For the more energetic there is plenty to do, walking and cycling are enjoyable from the front gate. 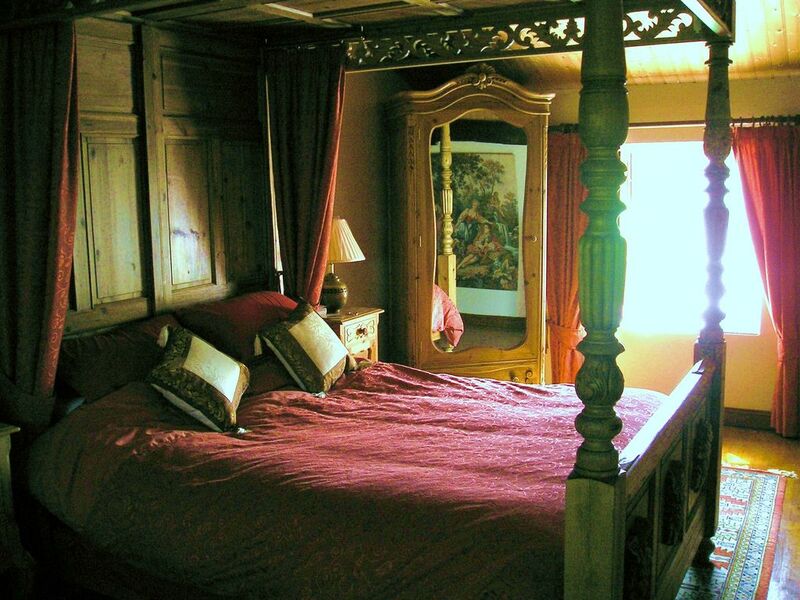 The main bedroom boasts a king size four poster bed, the other double bedroom has a romantic Louis xiv bedroom suite and the twin studio bedroom has en suite bathroom and its own balcony. The main house bathroom has bath,shower and separate wc. The studio twin bedroom has en suite bathroom ,bath,shower&wc also there is a further wc on the ground floor in the main house. Available only minutes away there is horse riding and fishing. The Charente river at both ruffec and mansle are popular beauty spots where the visitor can enjoy swimming and canoeing or maybe a picnic by the waters edge. The nearest seaside is approx 1 hour and 40 mins relaxing easy drive by car. bird watching, Garden and River Charente. hiking, From the front door. Booking Notes: To book simply pay a deposit of £100 per week and the balance due 8 weeks before the start of your holiday. We request smokers do not smoke inside the house thank you. All dates referred to in any correspondence mean arrival date and departure date. Changeover Day: Saturday arrival after 2pm and departure before 10am. Although our prefered arrival day is Saturday On certain occasions we would consider different arrival days, please enquire.